The lashing knot is a type of knot designed to hold wooden poles, together in construction of buildings, fences and towers. Lashing is intended to be a permanent binding used as an alternative to lag bolts, screws and nails. Constrictor knots which are used to hold concave objects in bundles. Lashing is simular but is used to hold together two or more poles at a fixed angel or perpendicular. The structure of a lash is nearly the same with each type of lash you do: To start off, you hold the poles in the position that you would like to end up with. You then start do a timber hitch around one of the poles to secure the rope onto the pole, in the case of the stockgrower's lash an adjustable grip hitch or tautline hitch is used as a timber hitch can slip when the the lash is opened. Start to wrap the rope around the poles(the way you wrap will change when you do different lashings. 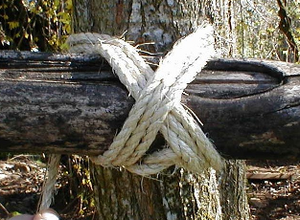 Once the rope is wrapped around the poles enough times to be considered very tightly wrapped, you end with two timber hitches and one or two clove hitches. Used for tying spars or poles together when they must subsequently be swung apart slightly in a scissors motion (shear legs). Shear lashings may also be used in place of round lashings to join spars of unequal thickness in a straight line. Used for tying two spars at a straight angle where the spars are clean and of equal diameter; if not you should use a sheer lashing or when security of the lashing is vital. Used for tying three spars together which can be arranged to form a tripod. This structure is extremely simple, using only 1 lashing to complete. You will need 3 small-medium-sized poles, all roughly the same length. Use a tripod lashing to lash them together, with the rope being lashed at the same end of all three poles. You can then move the poles around in a certain fashion to make a pyramid-like shape. This can then be used to hang a pot above a fire, or hold a water-dispensing device over the ground. Attaching the tractor post to latch post on a barbed wire gate. The stockgrower's lash is used to pull and hold closed barbed wire gates. It allows tight barbed wire to be closed without a stretcher by using the tractor post and latch post of a gate as pulleys. It can also be used to lash any wooden or steel gate to a post so long as there is space between them and the lashing is wedged to a post. This is an important knot to understand even by anyone who comes across such a gate and should be understood before going hiking, hunting or any other outdoor activities out of respect for landowners. With the wide variety and flexibility that a lashing knot offers, there is also its fair share of uses. 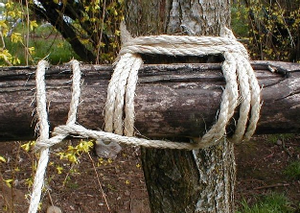 Square and diagonal lashing can be used to hold rales to fence posts and round lashing can be used to make poles which sit on the ground. This is an extremely hard structure to make, and could be extremely hazardous if done wrong. To make this structure, you will first four two large-sized poles (these should all be nearly equal in length). You will also need 4-16 medium-sized poles, depending on how high you wish to make the platform. Lastly, you will need a large amount of small poles, or a wooden board. To start off, take two of the long poles and place them on the ground, parallel to each other. Now take two of the medium-sized poles and lash them together with a square lashing. Lay this 'X' on top of the the two parallel poles, and do a diagonal lashing on each of the four corners of the X. You can use another X if the long poles are long enough. Repeat all of what was just said. Now, you will have to make 2 or 4 more X's, depending on whether you used 1 or 2 X's initially, respectively. Stand up both of the sides you just made, so that they are parallel to each other. Take the X's you just made and diagonally lash them to connect the sides together. Now you just need to climb to the top of the tower and use round lashings with the rest of the small poles to make a floor for the top. This page was last edited on 20 October 2016, at 23:31.